Screw compressors are the most widely used compressor design in the industry. They supply compressed air continuously, are very well controllable, extremely efficient and quiet (occupational safety, environmental protection, noise emission). There are versions with different numbers of stages, various cooling and lubricating processes or drive types. 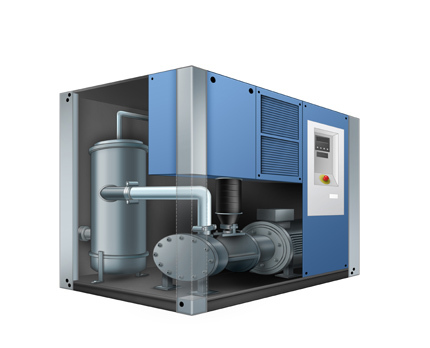 The most common model is the single-stage, oil-lubricated rotating screw compressor. Wherever even the lowest quantities of oil in the compressed air would contaminate the product or the process, oil-free compressors are used. At the air inlet and the compressed air outlet, pressure and temperature are measured. For this, both pressure gauges/ thermometers for direct display, and also pressure sensors/ resistance thermometers with Pt100 or PTC sensors are standard instrumentation. In addition, pressures and differential pressures at the suction filter and at the oil reservoir/ filter are monitored. Further temperature measuring points are found at the oil cooler or in the area of compressed air preparation (e. g. filter drier). Furthermore, our measuring instruments also reliably monitor the pressure and the level in the compressed air tank.